August 28, 2016 August 26, 2016 Dan O.
Everybody’s mom and dad have problems. Some more than others, but you get the idea. Growing up in Jerusalem during the 1940s was rough for most people, but for Amos Oz (Amir Tessler), it was a whole lot more so. His mother, Fania (Natalie Portman), and father, Arieh (Gilad Kahana), were clearly in love from the first time they met, and while the love never quite faded out, it came and went in short spurts. However, for Amos, he was the apple of his mother’s eye, so nothing bad ever came of him and whenever he needed a little cheering up, she always gave him an imaginative, but interesting story to keep his little mind alive, awake, and most importantly, hopeful. After all, Jerusalem was going through a huge crisis at this point in time, and for a family like Klausner’s to live and survive, they had to rely on one another to be as strong as humanly imaginable, even if that was a lot easier said then done. Natalie Portman’s career has been a bit of a strange one since she won the Oscar for Black Swan. While mostly every other actor after winning an Oscar would have roles being flung at them from every which direction, Portman opted to take a quieter, more distancing approach to the whole film-business; while she may have been high in-demand, she’s only done about seven or so movies, with two of them being Thor flicks, one being a Terence Malick flick that she showed up in for about five minutes, the one-two punch of Your Highness and No Strings Attached, of course, her passion-project that was unfortunately delayed for about four years, Jane Got a Gun. It’s interesting to see this happen to someone who is still, yes, a big name in the world of Hollywood, but it’s also a bit dispiriting – she’s not just a great actor, but seems to get more and more interesting as she gets older and wiser. And of course, there’s another passion-project of hers with A Tale of Love and Darkness, which shows Portman really doing whatever it is that she wants, because she can, but it’s not all about making a statement here. If anything, you can tell that there’s a lot to this story and this mood that Portman herself relates to and it helps give an emotional edge to a story that could have easily just been one, long snooze-fest of Portman finding all of the lovely little quirks about this intimate tale. Which is all to say that as a director, yeah, Portman is quite good. She’s competent enough to know what works well, and what doesn’t; the smaller, more subdued moments with this family are perhaps some of the best and most interesting that the movie has to offer, because Portman doesn’t really have to do a lot but just keep her camera focused in on the characters, what they do, what they say, and how they act. It works well for the movie, if you only take it solely as a character-study of a family going through all sorts of problems, but when it tries to handle more than it can chew, then unfortunately, Portman begins to stumble. She’s good at the small stuff, yes, but when it comes to making this tale a bigger one that has to do with the fighting, tension, turmoil, and violence over in Jerusalem, it doesn’t quite connect. But then again, that may be more of a problem with the material, than it is with Portman. She may have wrote and adapted the film from the autobiography, but she also may have had a lot to handle, what with the book being a coming-of-ager, as well as this political allegory for Jerusalem’s history. The book itself is a tad messy, which, as a result, so is the movie and it only makes sense that Portman have the same issues that the book itself may have had. But as an actress, nope, Portman is terrific. So sad and drenched. Yet, she’s Natalie Portman so of course she’s still beautiful. Then again, are you surprised? Portman’s great in the stoic scenes as Fania, where you get a sense that she does truly love her family and Jerusalem, but is also, slowly and surely, getting more and more depressed with each and every passing-day. It’s a role that could have been terribly over-the-top and showy (something that Portman has been accused of in the past), but it’s one that she works so well with because she just sits there and give us all that pained and upsetting look she’s just about mastered by now. Still though, as good as Portman may be, the rest of the cast around her kind of fumbles, if only because she’s so good as the heart and soul of the story. Gilad Kahana is fine as her husband, even if his character’s intentions don’t always make the most sense, and Amir Tessler, who plays a young Amos, is also fine, if mostly because he doesn’t have to do all that much. Most of the time, he’s just sitting around and reacting to the world around him and that’s all it needed to be – after all, he’s a young kid, growing up and trying to make sense of the world that he lives in, while it’s all sorts of crazy and violent for reasons he can’t even begin to understand. It’s a sad reality for him, but what I imagine many other kids his age had to go through. 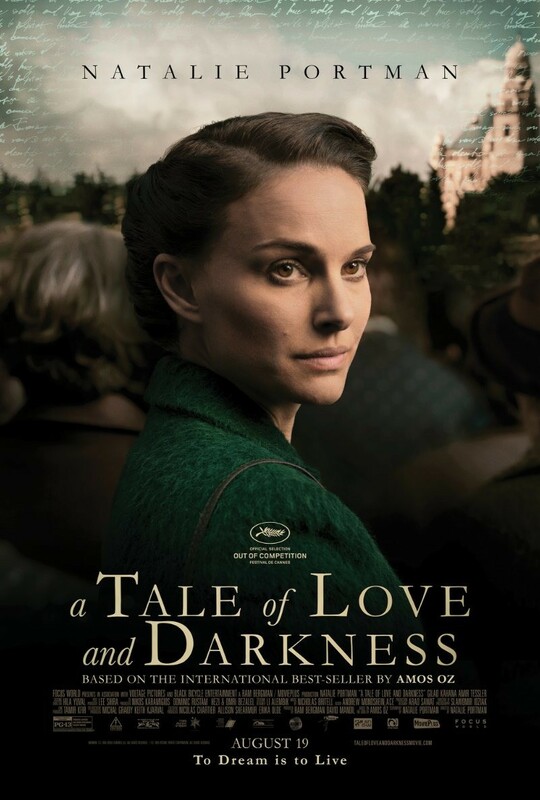 Consensus: Though it doesn’t always connect, there’s a real feeling of emotion and passion to A Tale of Love and Darkness, that makes Portman’s sometimes messy direction still something to be admired. Think i’ll skip this one. Sounded like too much of a vanity project from the start. Ah, truer words have never been said! I love Portman so, so much. But you’re right, her career is a weird one. I want her to have a fantastic come-back role like Winslet in ‘The Reader’. Need to check this movie out!